Straight after marching with the London Slutwalk, we hot footed it back to Hyde Park for the eighth London World Naked Bike Ride - and this year must have been the biggest ever. 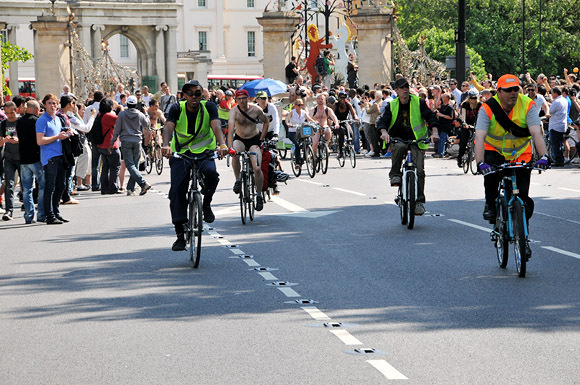 Over a thousand cyclists took part this year and went for a ride arond the streets and sights of London as part of an environmental protest against car culture and and oil-based economy. Another objective is to have a load of fun! The cyclists gathered at Hyde Park in the glorious sunshine. 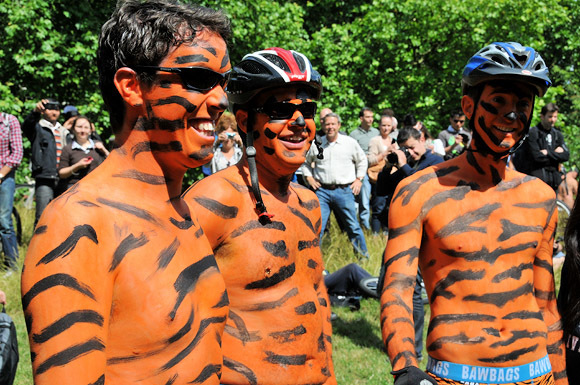 The atmosphere was good natured in the park as the riders prepared for the ride. The only bit I didn't like was when one attractive girl found herself being closely filmed by a rather insistent congregation of silent blokes. Other riders quickly stepped into to see if she was OK and although she said she was alright with the situation, it still felt a tad uncomfortable. Of course, if you're going to get your kit off in a public place you're going to attract attention, but this felt just a tiny bit, well, sleazy. Happily, the ride was soon underway, heading out of Hyde Park in the June sunshine. Riders getting ready to head into central London.